1. While seated on the edge of a flat bench, grasp two dumbbells in an overhand grip. 2. Rest the dumbbells in an upright position on the edge of your knees. 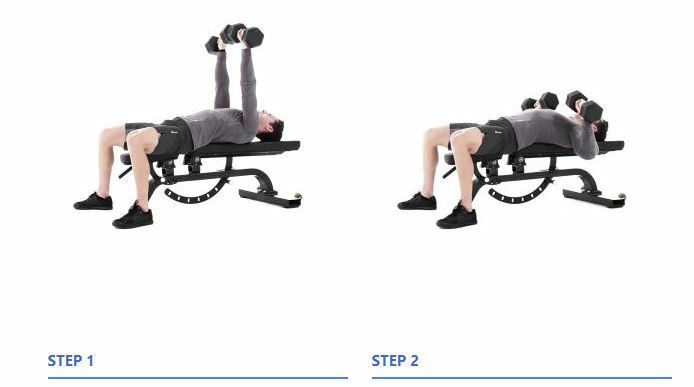 Carefully lie on the flat bench bringing the dumbbells to the sides of your torso at chest level. Make sure to bring the dumbbells up simultaneously. Feet should be planted firmly on the floor. 3. Slowly adjust the dumbbells with your arms fully extended at right angles to the floor. Press the weight up to the locked position. The dumbbells should be held directly over your chest area, slightly touching each other with palms facing forward. 4. Slowly bend your arms and lower both dumbbells in a slow, controlled fashion to your chest. The dumbbells should be at the sides of your chest. 5. Slowly press the weight back up from the sides of your chest to the starting position. Do not bounce the weight from the chest. Keep you elbows out and away from the trunk of your body. The flat dumbbell bench press is an alternative movement to the traditional barbell bench press. The movement is basically the same as the barbell bench press and the muscles used are the same. This exercise is also considered a compound movement. The only difference in the movement is the balance. Each dumbbell must be lifted independently of one another which can be somewhat more difficult since one side of your body may be stronger than the other. However, this movement is very beneficial because it forces your weaker body part to become stronger. This is a great muscle mass builder for the chest as well as for the shoulders and triceps. For those of you who experiencing a plateau with the barbell bench press, try doing flat dumbbell bench press’ instead for 4 weeks- They do wonders for getting you off a plateau.